We all run low on energy some days, and devouring a conveniently-packaged bar seems like a quick fix. But before you tear off the wrapper, flip that energy bar over to see how nutritious it really is. Like it or not, the popular Clif Bar is one of the worst offenders. Each Clif bar has about six teaspoons of sugar, which somewhat cancels out its more redeeming qualities. The Chocolate Brownie flavor PowerBar packs in a whopping 360 calories and 11 grams of fat. It doesn’t quite seem right that candy bars have started disgusting themselves as nutrition bars, does it? Fortunately, there is a better way to snack. 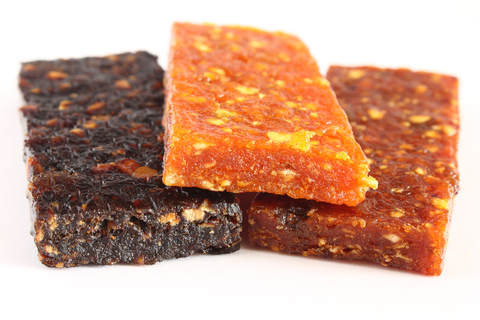 Seaweed is an amazingly healthy ingredient that the popular energy bar companies must not have gotten the memo about. Not only is seaweed a great source of nutrition for ocean life, it also provides the human body with essential fiber, calcium, iron, protein, chlorophyll, and antioxidants. Everyone’s body can use a good cleanse from time to time, and seaweed boasts of excellent detoxification and digestion properties. And fortunately, you don’t need to take a skimmer to the ocean’s surface to incorporate this power food into your diet. We actually sell a Seaweed Powder of our own! Capsules and powders harness the nutritional properties of seaweed, while packaging them in a convenient and accessible way. Karen Sherwood from EarthWalk Northwest shared one of her favorite seaweed energy bar recipes that you can tailor to your tastes and make your very own at home. So whether you’re in the market for high-energy fuel in your hiking backpack or a pick-me-up snack in your office desk drawer, get your energy the natural way. Stop reading through long lists of ingredients on your packaged food items and simplify your life with safe, natural ones that you understand and mix together yourself. And since store-bought energy bars aren’t exactly cheap these days, your wallet will thank you almost as much as your body. Elena Vo - The recipe sounds absolutely delicious. I love that it doesn’t have more than three ingredients. Suzanne Shaw - Can’t wait to try these, really different. Lori Lemke - Those energy bars look delicious! Definitely will be trying these! Debra Privett - So many times you buy a healthy bar and trust that it is good for you. Not anymore!!! I know I can always trust Seagate thank you.